His Excellency Yousuf Hamad Al Shaibani is currently the Chief Executive Officer of the Dubai Electronic Security Center (DESC). 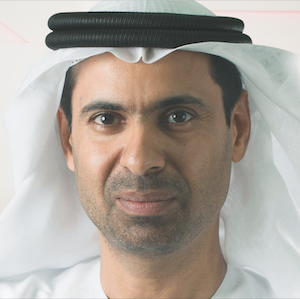 With over 18 years of experience serving in the government sector, Al Shaibani has been associated with the organisation since its establishment. He has held several senior positions in DESC including being a member of the organisation’s board of directors. Recognised as one of the founding members of DESC, Al Shaibani has made valuable contribution towards the growth and development of the organisation. Al Shaibani graduated from Etisalat University College (now known as “Khalifa University of Science, Technology and Research – KUSTAR”), Sharjah in 1995 and went on to receive his Masters Degree in Microelectronics Systems Design from Central England University (now known as Birmingham City University) in UK in 1997.